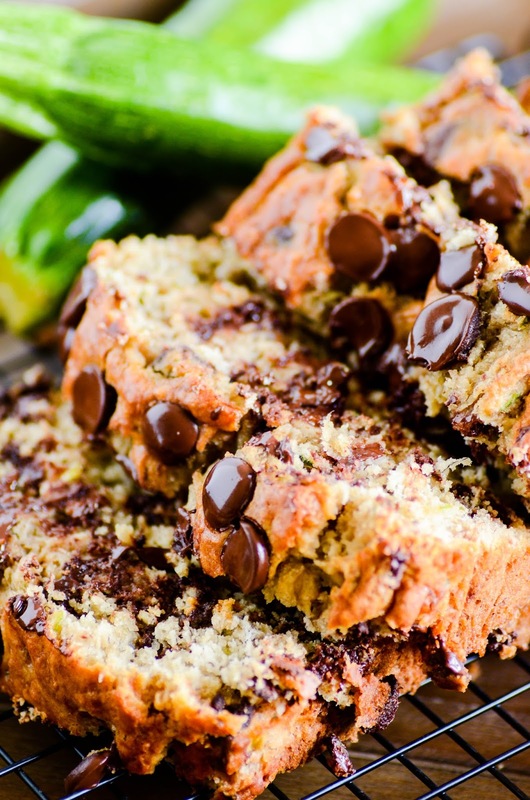 It's hard to believe this indulgent chocolate chip bread is full of fruits and vegetables! My mom has made the same recipe for banana bread for as long as I can remember, and it's a solid part of the memories from my childhood and teen years. I can even remember my mom sticking a wrapped loaf of her bread in my backpack as she put me on a plane to head out West for college. Her banana bread is home to all of us kids. I think it will always be my favorite food to find sitting on her countertop when I go sniffing around for a treat at her house. Today's recipe is a spin-off of that special recipe. To my mom's banana bread, I simply added one medium zucchini (shredded, of course) and an extra dash of nutmeg. It's still her famous bread, but with an extra serving of vegetables that no one will ever suspect! Preheat the oven to 350ºF. Mash the bananas. Whisk together with the sugar and the egg until smooth. Pat the zucchini dry with a paper towel, and then fold into the the banana mixture. Mix in the oil and the vanilla. Add the remaining ingredients and gently mix by hand until batter forms. Spray a 9x5 loaf pan with nonstick cooking spray and line with parchment paper. Pour the batter into the prepared pan. Bake for 55-60 minutes, until the center is set and passes the toothpick test. Let cool in the pan for about 30 minutes before transferring to a wire rack to cool completely.